The history of the Swiss Guard goes back to 1506 when Pope Julius II invited some 150 Swiss soldiers to serve as his personal guards. At the time, Swiss soldiers had a high reputation for bravery and skill, and were in demand across Europe. On May 6, 1527, however, more than 100 members of the Swiss Guard gave up their lives on the steps of St. Peter’s Basilica in defense of the pope when Rome was being sacked by Spanish troops of the Holy Roman Empire. May 6 is now the date on which new members of the Swiss Guard swear to protect the pope—even at the cost of their lives. 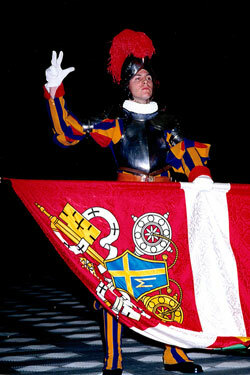 According to the Vatican’s website on the Swiss Guard, a prospective member of the 110-member Vatican armed forces must be an unmarried male citizen of Switzerland between the ages of 19 and 30 who is Catholic, “of good moral [and] ethical background,” has attended Swiss military school, be at least 5 feet 7 inches tall, and has either a professional or high school diploma. Those accepted into the Swiss Guard must serve a minimum of two years. They live in barracks in Vatican City that overlook St. Peter’s Square. Their daily duties include standing guard at the entrances to the apostolic palace, and at all external entrances to Vatican City. They also serve as guards during public appearances by the pope at the Vatican, such as liturgies and general audiences. When not on duty, members of the Swiss Guard can play in the corps’ band or sing in its choir, attend daily Mass celebrated by its chaplain or join its soccer team in matches against other squads from within the Vatican. The work of the members is more than ceremonial. According to Benedictine Brother Mauritius Honegger, a monk of Einsiedeln Abbey in Switzerland and a former member of the Swiss Guard, plain-clothed members of his former unit as well as Vatican policemen restrained a woman who pulled Pope Benedict XVI to the ground during the opening procession of Midnight Mass on Christmas at St. Peter’s Basilica in 2009. Although some members of the Swiss Guard carry out their duties in plain clothes, their ceremonial uniforms are well known. According to the Vatican website on the Swiss Guard, their distinctive orange and blue uniforms, while popularly believed to have been designed by the great Renaissance artist Michelangelo, are actually the work of a previous commandant of the guard less than 100 years ago.